Is your school going to be closed due to weather? Has a child suddenly become sick or injured? Is there a drill that the parents need to know about? 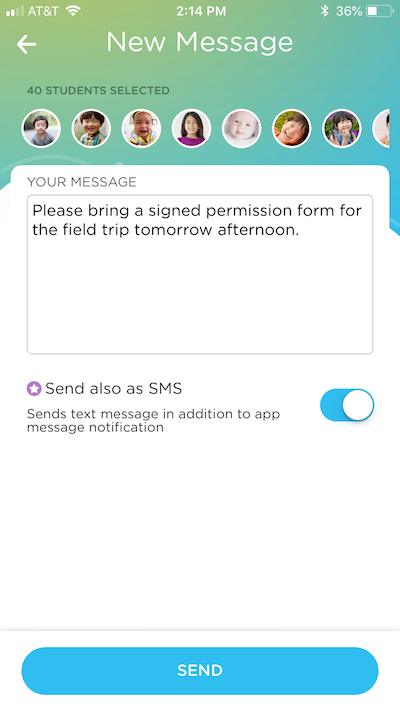 While you have the option to send parents a message using the app's push notifications, send out an email newsletter, create a pop-up message during Sign In-Out, or call the parents directly from a child's profile in the app, in cases of real emergencies, you can choose to send a text message. If you have an urgent message, turn on the "Send also as SMS" option while composing a message (see below). Enabling the SMS feature will send your message as a one-way text blast to the selected families' cell phone numbers on file. Parents will not be able to reply to the text, but they will most assuredly see it. Each school has a limit on how many individual texts can go out each month, depending on the size of the school. Please contact us to find out how many texts your school is limited to. If you would like to increase your limit to 10,000 texts, you can pay an additional fee each month. Texts have a 300 character limit. If text messages are longer than 300 characters, parents will be able to view and respond to the full message from the app. This feature is only available for mobile numbers in the United States.